Move over, Prince George Alexander Louis, there’s a new royal baby in town. Prince George may be #3 in line for the British crown, but Mia Grace Tindall is still #16. Mia Grace made her first appearance on the world stage on January 17, 2014, when her father, Michael Tindall, announced her name via Twitter. 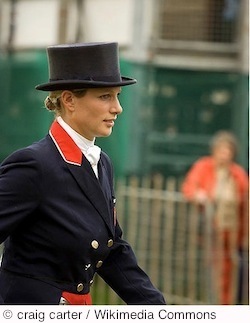 Her mother, Zara Phillips, is a granddaughter of Queen Elizabeth II and Prince Philip, Duke of Edinburgh. Zara’s mother, Princess Anne, is the only daughter of the queen. That makes Prince George and Mia Grace first cousins. Zara is the little prince’s godmother. Baby Mia Grace was born into a family of world-class athletic champions. Mama Zara won a silver medal as part of the British equestrian team at the 2012 Olympics in London, where she rode a new horse called High Kingdom. Zara’s mother, Princess Anne, presented the silver medal to the team. Mia Grace’s father is Michael Tindall, a player for England’s national rugby team. Phillips and Tindall met in 2003 in Australia when Tindall and team were competing for the Rugby World Cup. The English team won the championship and he, apparently, won her heart. Buckingham Palace announced the engagement of Phillips and Tindall on December 21, 2010, and the couple was married at Canongate Kirk in Edinburgh, Scotland, on July 30, 2011. The bride wore the Greek Key (Meander) Tiara that once belonged to her great-grandmother, Princess Andrew of Greece and Denmark. Princess Andrew is the mother of Prince Philip, Duke of Edinburgh and husband of Queen Elizabeth II. When the Queen’s daughter (and Zara Phillips’ mother), Princess Anne, married Mark Phillips, she also wore the Meander Tiara. On July 8, 2013, Buckingham Palace issued the news of Phillips’ pregnancy. She gave birth on January 17, 2014, at Gloucestershire Royal Hospital with her husband at her side. The family lives in Gloucestershire. Phillips and Baby Mia hold no titles of royalty or nobility. They do not hold claim to royal status by right of birth since they are descendants of the maternal line of the English monarchy. In addition to her equestrian endeavors, Phillips carries on the royal tradition of charity. She is actively engaged in causes that support children with special needs, the Great Ormond Street Hospital for Children, and the Mark Davies Injured Riders Fund. She donated an evening gown worn to the London premiere of the film, Seabiscuit, for tsunami relief and she’s affiliated with medical research for spinal cord injuries and cancer. Phillips became a designer of equestrian clothing in 2010 when her line of clothes - ZP176 - was launched as part of the product line of the Musto Outdoor Clothing company. When Phillips first represented England in equestrian events, her team number was ZP176. Source: “UK Royal Baby Named: It’s Mia Grace Tindall.” ABC News. ABC News Internet Ventures. Jan 23, 2014. Web. Jan 29, 2014.